DOLCETTO – PIEMONTE'S NEXT STAR? Dolcetto, Piemonte's workhorse grape, has until now provided the region with early-ripening, easy-drinking reds. These characteristics have kept it firmly in the shadow of Nebbiolo, the grape of Barolo and Barbaresco. Dolcetto is universally known as producing deep violet-coloured wines, with abundant aromas of red crushed fruit, violets and with a distinct drying spur of tannin, and it is, most importantly, very modestly priced. The variety is considered much less demanding than Nebbiolo, which needs, and gets, the very best exposure in the vineyard, while Dolcetto happily retreats to the sites where Nebbiolo's famous tannins would never fully ripen. As it ripens much earlier than Piemonte's signature grape, it is not only a very accommodating variety in the vineyard, but also in the cellar. By the time Nebbiolo is ready to to be harvested, Dolcetto's fermentation has long finished, leaving the tanks available for the most important harvest of the year, which starts in late October. Although the grape's name indicates sweetness, this in reality is no reflection of the characteristics of the final wine, which is completely dry, and, very Piemontese, with a clear tannic structure. The name apparently refers to the actual taste of the berries, which are much sweeter than Nebbiolo, at least to the Piemontese palate. Easy to grow and quick to vinify, it allows growers a speedy return, and the rest of us something to savour while Nebbiolo is still maturing. The story so far is very similar to that of Barbera, a grape variety, which, until recently, shared Dolcetto's Cinderella status. However, Barbera's fortunes and reputation changed for the better when producers discovered that with a better site and lower yields it resulted in far more complex wines, with riper acidity, and, at least as important, showed affinity with barriques. The new wave Barberas appealed to an international public, and the use of the small oak casks conveniently allowed for a considerable price increase that wine lovers were willing to pay. Dolcetto is nowhere near such an upgrade, but this may have less to do with its intrinsic qualities than its perceived reputation as a simple variety. Within Piemonte itself the picture is more diverse, and several DOCs provide it with its own designation. Except for the catch-all DOC of Langhe Dolcetto, there is Dolcetto d'Alba, by far the largest zone; Dolcetto di Diano d'Alba, or Diano d'Alba, in between the Barolo communes and the city of the same name; Dolcetto delle Langhe Monregalesi, in the very south of the region bordering the mountain range that separates Liguria from Piemonte; the very obscure Dolcetto di Ovada (which nevertheless was recently upgraded to Ovada DOCG) around the town of the same name near Gavi; and, perhaps the most important of these, Dolcetto di Dogliani, immediately south of Monforte d'Alba. Whereas Dolcetto d'Alba by law must have a minimum of 11.5% alcohol, and an extract of 22 g/l, Dogliani needs to come up with 13% alcohol and a minimum of 24 g/l of extract. Also yields with 56 hl/h are considerably lower than the 63 hl/ha for Dolcetto d'Alba. All these are indications that Dogliani as a region must possess something special. Dogliani seems to be in ferment, with a recent elevation to DOCG, Italy's highest quality designation. The DOCG can either appear on the label as Dolcetto di Dogliani Superiore, or straight Dogliani, analogous to France's tradition of naming wine after its origin rather than the grape. Confusingly, there is also a straight DOC, Dolcetto di Dogliani. Adding further to the confusion is the fact that the DOCG also provides for a Dogliani Classico designation, as in this case Classico does not signify, as in Soave or Chianti for example, a historic subregion, but merely designates a lower yield. It is a thorn in the side of Nicoletta Bocca (pictured - just), of the San Fereolo estate in Dogliani. Nicoletta Bocca, a relative newcomer to the region, started to acquire a patch of Dolcetto vineyards in 1993, after studying fashion design and history. Frustrated in her ambition to create a museum that would document the history of Italian fashion, she turned to the countryside she had been introduced to by her father who had been a second-world-war partisan in the Dogliani region. When asked how one turns the focus from fashion to viticulture, she explained that she likes things that take time, which she says mirrors her character more than the ever-changing world of fashion. One wouldn't immediately think of Dolcetto as a variety that embodies stately ageing, but this is exactly what her Dogliani wines demand. I was presented the proof of this in a vertical of six vintages (see notes below) going back to 1998 from the 2006, a wine that will need considerable time to develop. What the flight seemed to indicate is that Dogliani must have a very special terroir, allowing Dolcetto to turn into something so much more serious than the run-of-the-mill, but very pleasant, Dolcettos that are on the market. Keen to crack the serious Dolcetto code, I asked Bocca if terroir is the crucial factor in the equation. According to her, the limestone clay soils of Dogliani result in grapes with lots of tannins, which need prolonged ageing. Dolcetto's skin has a high concentration of pigments, while most of its tannins are in the pips. The conventional way of vinifying the grape aims at getting as much colour out of the grapes without leeching tannins out of the pips. Therefore most producers minimise the maceration time in tank and ferment at lowish temperatures to preserve fruitiness. Bocca, however, doesn't use any temperature control, no sulphur and only indigenous yeast. The grapes are vinified in open oak casks to prevent the risk of the reduction that Dolcetto is prone to. She uses cap plunging, with regular remontage employed only to aerate the wine. She also lets the temperature go up to around 33ºC. The unusually high fermentation temperature causes the primary fruit flavours to 'boil off', but she isn't bothered by that in the least, as she is much more interested in complexity as a result of long ageing. And ageing is what her Dogliani gets. After a total maceration time of up to 20 days, the wine remains in cask for a year, followed by several years of bottle ageing at the estate, with the current vintage on the market being 2006. She acknowledges that it is too young, but she cannot entirely ignore economic factors in running her estate. As always, quality starts in the vineyards, and Bocca tends hers biodynamically, with the main aim to get the ripest grapes. Unsurprisingly, the best vineyard sites with south-east and south-west exposures reserved for Dolcetto. According to Bocca, a lot of Dolcetto is picked too early, with unripe, green tannins in the pips. But as the grape so swiftly and easily releases its anthocyanins, the wines are often pressed before the alcoholic fermentation has ended, and the tannin extracted from the pips. This results in an upfront, fruit driven and fairly simple wine, unlike hers. 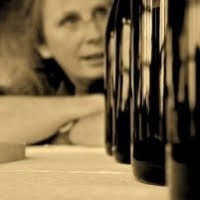 She has no formal qualification in either vinification nor viticulture, but relies on her neighbours, people who have made serious Dolcetto for as long as they can think. She mentioned as an example that she never does any shoot trimming during the growing season, as she noticed that her neighbours wouldn't do this either. While shoot trimming may force the plant to concentrate on the fruit, she says she claims to see the vine as a unity, and believes that the vine should not invest all its energy in the fruit, but also in its vegetative parts. This results initially in less concentrated fruit, but stronger and longer-lived vines, hers being between 40 and 70 years old. While Bocca is one of Dolcetto's main proponents in Dogliani, she says she is certainly not the one who first noticed its potential. The region, at least locally, has several producers who have always taken Dolcetto seriously. That's why she is not convinced by the Dogliani Classico designation, as for her, Dogliani Classico still signifies the 'conventional style', a wine for immediate consumption without any ambition or complexity, resulting in low prices. True Dogliani, even in Italy, is little known and remains a hand sell, which wine professionals and sommeliers alike will need to explain to the customer. My tasting notes on this fascinating vertical are below. Note the evolving name and status of the appellation.